We at PorchDrinking are no strangers to Big Boss. They’re one of Raleigh’s best and brightest breweries. But we are strangers to their new oak-aged “Strange Cargo” trio. At least we were, until now. Going from light to dark, the first in the oak-aged series is Brett Belle. She takes the latter half of her name from the base beer, the Belgian-style Hell’s Belle. The former half comes from the brewing process, which incorporates brettanomyces cultures during the barrel-aging. 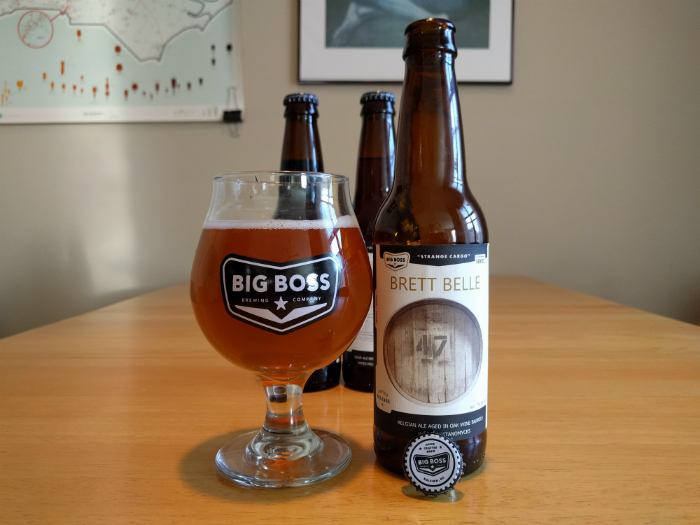 After about 120 days in the oak, Brett Belle finds its way to the consumer, you. At which point you’ll pop open the beer, give a nice pour, and enjoy. 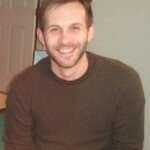 You can expect a translucent straw, burnished gold color accompanied by an earthy, musty scent common to Brett beers. In the background, you’ll find suggestions (or perhaps memories) of the Belgian spice and brightness. Once it’s beyond your teeth, it’s farmhouse funk all the way down. The light-medium body and dry finish ensure it won’t overwhelm your taste buds, but the musty barnyard-iness lingers enough to make its presence felt. The second of our oak-aged trio is the Flanders Red-inspired Saints & Sinners. Perhaps the most remarkable quality of this beer is the fact that it’s brewed with corn from one of the oldest functioning stone mills in the country, Raleigh’s own Yates Mill. To round out the brew, S&S is aged in oak foeders (“FOOD-ers”) for at least six months before bottling. True to its inspiration, S&S pours a warm red with orange hues. Whatever foam there is (which isn’t much) dissipates readily. 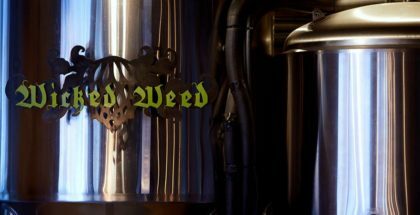 The smell betrays the beer’s lactic acidity and suggests malt sweetness as well as a hint of something unusual. It takes a moment to realize what exactly that something is; it’s the corn! 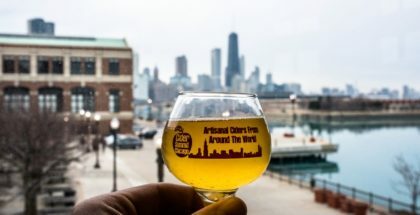 On the tongue, puckering acidity is first and foremost, followed by a sweet fruitiness that gives way to a distinct yet mild corn flavor on the back end. Of the three beers sampled here, Saints & Sinners is easily the most vinous, a sentiment echoed by its light body and dry texture. There is little bitterness, if any at all, and the relatively low alcohol (5%) leaves you with a sound body and mind. 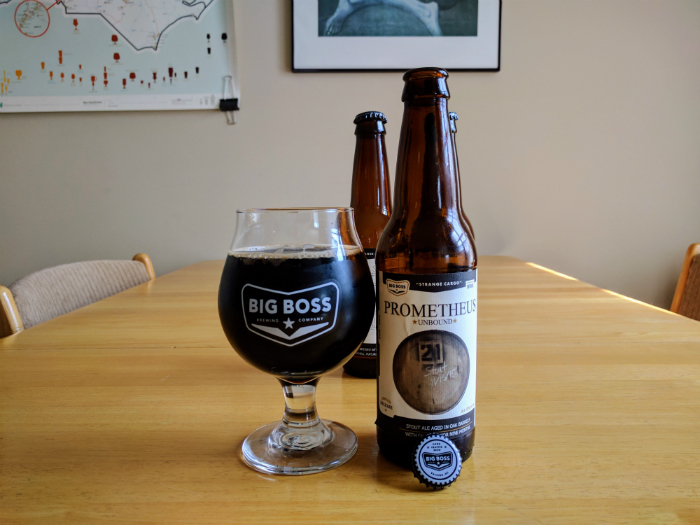 The last and darkest of the oak-aged trio is Prometheus Unbound, a beer we’ve seen before here on PorchDrinking. But this isn’t the same ol’, same ol’. 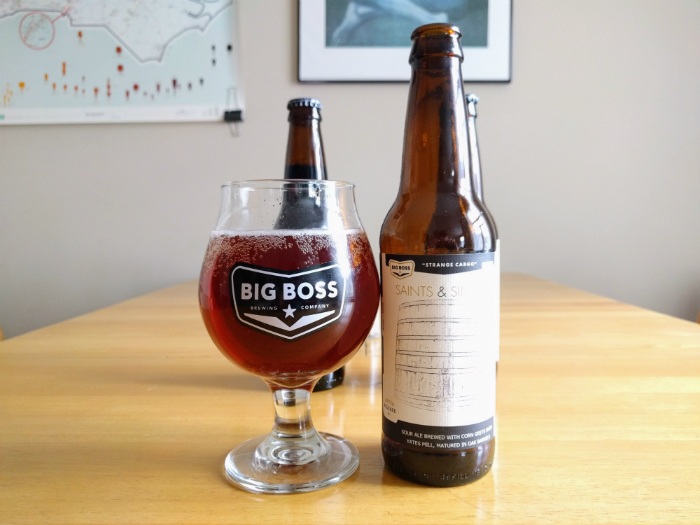 This iteration consists of Big Boss’ stout base stored in bourbon barrels with cherries for nine whole months. That kind of time affords the beer plenty of opportunity to extract the bourbon and oak from the barrels as well as the sweet-and-sour of the cherries. In the glass, Prometheus Unbound is so dark brown as to appear black, but if you can catch the light just right, you’ll reveal hidden garnet hues. The foam is a light mocha color but doesn’t hang around long, just long enough for visual contrast. The real excitement begins with smelling the beer. Chocolate malt and bourbon jump out immediately. Less obvious is the hint of dark fruit, especially cherry. But taste diverges somewhat from smell. The chocolate is less obvious than the roasted character of the malt, while the bourbon is steadfastly present. The cherries play more of a supporting role, but that doesn’t mean you won’t notice them; they’re there beginning to end. The end result is a decadent sipping stout fit for dessert or capping the night. There’s something for everyone in Big Boss’ oak-aged beers. You’ve got earthy funk in Brett Belle, wine-like tartness in Saints & Sinners, and roasty bourbon in Prometheus Unbound. If you plan to pick one up, expect to pay about $5.00 a bottle for any one of them. It’s a little pricey, but it’s still better than a lot of what you’ll find in bars. If you do try to find these, your best bet is bottle shops, which are all over the Triangle. 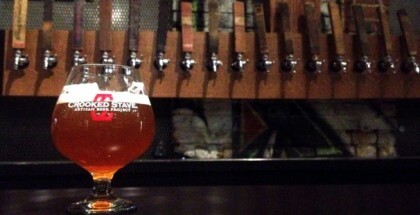 If you ever find yourself on the east side of Raleigh, head to the Big Boss’ taproom to try one of these on tap. Cheers!